This 50-page book provides real solutions to maintenance storeroom management problems. Management teams from the maintenance storeroom, purchasing and IT departments should read this powerful and practical book. 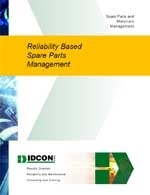 Readers will take away tools and knowledge to dramatically improve spare parts and materials management.